Lying on the banks of the Thu Bon River, Quảng Nam province ( in the South Central Coast of Vietnam), Hoi An Ancient Town is an exceptionally well-preserved example of a South-East Asian trading port dating from the 15th to the 19th century. Hoi An town is small and peaceful, the kind of place where you may get stuck for a few days, whether it is intentional or not. Originally known as Faifo, this antique town is bordered on its southern side by the Thu Bon River, along which there’s a number of small cafes. 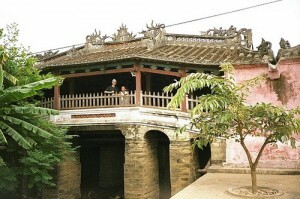 Over the last few years, Hoi An has become a very popular tourist destination in Vietnam. Its buildings and its street plan reflect the influences, both indigenous and foreign, that have combined to produce this unique heritage site. Despite the fact that it is now a tourist haven, the artistic atmosphere and local friendly people create an inviting environment.